Deep wave weave is brilliant and is a great balance between body wave and deep curl hair. 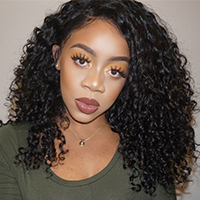 This curl pattern allows you to create a gorgeous and luscious deep wave hairstyle. Each bundle of hair weave has been inspected to be 100% human virgin hair and chemical free. To take a good care of each bundle of weaves, please ask the advice of professional perming agents before straightening, styling, washing and dying.